Use the options in this pane to make precise adjustments to the size of printed output. These setting provide a means to compensate for variations in the dimensions of printouts from different printers. Create a rectangle sized to fit the desired paper dimensions (e.g. a 7” x 7” rectangle for 8.5” x 11” size paper ) and print it out at a scale of 1.0. Measure the printed output and compare it to the model dimensions. 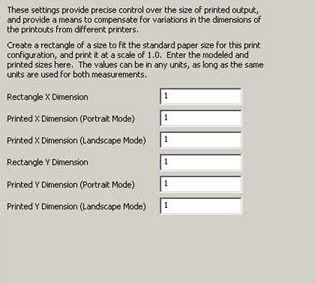 Enter the model dimensions and the printed output dimensions in the provided input fields. The values can be in any units as long as the same units are used for both dimensions.